Doom Metal is the music equivalent of a good wine or a nice beer. When it is done right, it just is good and it will get better. Many bands are just like that and that is the reason for the way we love it so much. Poland’s Evangelist is one of those types of wines that are good and will get better. Poland is known more for its extremes in Death Metal, but here comes Epic Doom Metal from Krakow. Mixing Candlemass’s effective riffing and clear but evil vocals with a odd flavouring of Iron Maiden with slow Metallica and even a little of Mercyful Fate at times as well. The results are phenomenal to say the least. 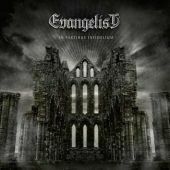 Slow, melodic with a nasty streak, Evangelist delivers traditional Doom with the epic tilt that makes Doom Metal that much more good. I just love 'Doommonger' and 'Children Of Doom' two best tracks that seem to sum up the brilliance and heaviness that Evangelist has to offer. Mixing addictive melodies with unforgeable heaviness, these songs are almost if they are alive. The other four are amazing on their own, but my two picks will sum up what the band is without saying one word. I love this album. From the music to the way it had been recorded it spoke to the metallic heart that beats in me. This is the bands debut album, and I look forward to more. Doom is a favorite style of metal for me and this band has catapulted themselves on to the top of this genre. They are the new Doom-millennium’s answer to Candlemass and they will escape that tag, and make themselves Lords Of Doom.